Download this FREE app on iPads and iPhones. It will be used extensively in class this year. 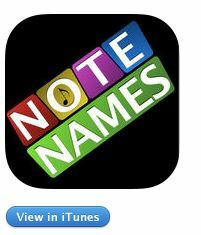 NoteNames+ tackles one of the most serious roadblocks for young musicians: The ability to instantly recognize the names of notes. Instantaneous note recognition allows students to process other important information, such as dynamics, articulation, phrasing, fingerings, and so on. NoteNames+ rewards speed *and* accuracy. Students will remain engaged rather than zoning out in a self-paced tutorial format.